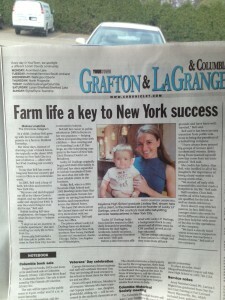 It’s so exciting when your hometown newspaper does an article about you and your growing business! The Chronicle-Telegram in Ohio ran this front page piece about Lindsay Bell, the president of Lucky Lil’ Darlings and her transition from mid-West gal to a business owner in the city. The article focuses on Lindsay’s supportive family background and how it serves as the basis of her growing company that provides families with the best babysitters around. Lindsay understands the need for responsibility in all aspects of life and credits her family for teaching her this important fact while supporting her in everything. This is such an amazing look at Lindsay’s family-oriented background and business!